By Nūr-ud-Dīn 'Abd-ur-Rahmān Jāmī (1414 - 1492), translated by E.H. Whinfield and Mīrzā Muhammad Kazvīnī and with a new introduction by Seyyed Hossein Nasr. 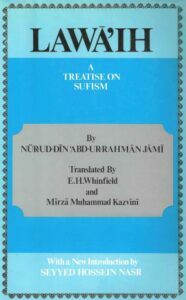 This work by Nūr-ud-Dīn 'Abd-ur-Rahmān Jāmī is a reproduction of the 1928 edition published by the Royal Asiatic Society. It contains the full text and English translation as well as a new preface by Seyyed Hossein Nasr. Jāmī needs little introduction. He is acknowledged to be one of the greatest poets of the Persian language and ranks alongside Sanā'ī, Attār, Rūmī, and Hāfiz. He was born near Herat in 817/1414, and became a renowned scholar mastering the traditional sciences of mathematics, astronomy, philosophy, and theology. He became deeply committed to Sufism, and was an influential member of the Naqshbandiyyah Order. The spiritual instructions he was to receive in the Order from two masters, Sa'd al-Dīn Muhammad Kāshghāri and Khwājah Nasīr al-Dīn Ahrār, were so to transform his very being. that he was able to create several masterpieces of Sufism of which Lawāʼih is a fine example. In this work he brilliantly describes the doctrines of Ibn 'Arabī and his school which had such a profound influence on all aspects of Persian life. It is by no means simply a commentary on Ibn 'Arabī, but as Hossein Nasr points out in his preface, 'it is the fruit of vision made possible by spiritual discipline and the attainment of sanctity'. On one to 'Truth', the sole Reality. "